My goal in this project was to make an electric furnace capable of melting scrap aluminum to make castings. The furnace is made from a BBQ propane tank that is cut into two pieces: a base and a lid. Both the base and lid are insulated with a few inches of ceramic fibre insulation. This leaves a 6″ diameter space in the center which is a snug fit for a common 6″ range element. The two terminals of the range element are passed through the ceramic insulation and through two holes drilled in the side of the base. The terminals are connected to either 120 VAC or 240 VAC if available. The following video gives a quick overview of the construction process. There are a few different DIY designs out there for building a furnace for melting aluminum. The first design I ever encountered was in a series of books by Dave Gingery describing how to build your own machine shop from scratch. The first book in the series described the construction and use of a charcoal foundry for casting aluminum parts. Mastery of the aluminum casting process was essential to completing all the other projects in the series (like making your own lathe and milling machine). I later discovered another of Dave Gingery’s books titled “Li’l Bertha” describing his design for an electric furnace for melting aluminum. This was all back in the 1990s before the age of the internet and YouTube. I eagerly experimented with this newfound (to me) technology, building a charcoal furnace, and later a propane furnace, and eventually the electric furnace I’m about to describe. An electric furnace is much safer because there is no open flame and the furnace can be completely sealed. If insulated well enough the exterior temperature of the furnace need not be excessive. The furnace I will describe reaches an exterior surface temperature of about 75 degrees C, which is not hot enough to pose much danger. An electric furnace requires no ventilation which means you can use it indoors. This is a big benefit in winter. An electric furnace is completely silent. An electric furnace has no consumables (unless you consider electricity to be a consumable). The primary disadvantage of an electric furnace is it cannot reach the same high temperatures that a combustion based furnace can, but either type of furnace is perfectly suitable for casting aluminum which melts at about 660 degrees C. An electric furnace also does not heat up quite as fast as a combustion based furnace, but the difference is fairly insignificant unless you are producing high volumes of cast aluminum parts. You can find a plethora of designs for DIY furnaces online. A Google or YouTube search will yield many results. So what’s so special about my design? The primary advantage of my design is that it’s extremely easy to build. After collecting all the components, I was able to build it in about 90 minutes. Most other electric furnace designs I’ve encountered take 10-20 hours to construct. The main reason my design can be built so quickly is that it repurposes a propane BBQ tank which offers several features of the furnace (sturdy base, lid, and handle) for free. My design also uses a common range element which is self supporting rather than a more traditional coiled wire element that would require building some kind of support structure into the interior walls of the furnace. Finally, my design uses ceramic fiber insulation which is much more easily manipulated than fire brick or refractory cement which are commonly used in other designs. Ceramic fiber is also a much better insulator than fire brick or refractory cement, giving my design a much lower surface temperature than most. The primary disadvantage of my design, perhaps, is that it is a little less robust, but for the limited amount of metal casting I do it suits me fine and I think it is a good entry level furnace for anyone who wants to dabble in aluminum casting without investing a lot of effort up front. To say that working with electricity, high temperatures, and molten metals is dangerous is an understatement. Different people will have different “acceptable levels of risk” based on their knowledge, awareness and risk tolerance. Just because I’m comfortable doing something doesn’t mean you should be. Please do not blindly follow my lead or anyone else’s. Understand the risks yourself and choose what’s acceptable to you. At a minimum, have a fire extinguisher handy and be sure you know how to use it. I already had all the materials and tools I needed to make this furnace. I don’t recommend buying parts new if you can salvage them but for those who wish, I have provided links to some suitable items from Amazon (disclaimer… these are affiliate links which means I will get a small cut… thanks for your support). Discarded propane tank. If you don’t have a used propane tank kicking around, try searching Craigslist, or visit your city recycling depot as they are often discarded. 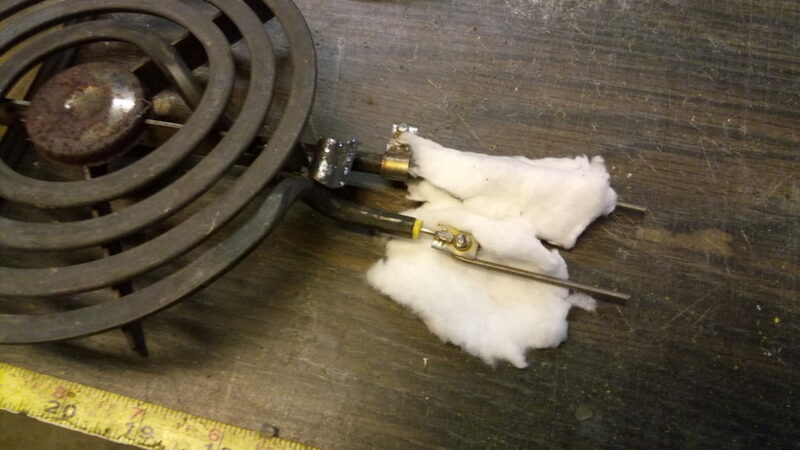 6″ Stove Element: http://amzn.to/2x3xTZC. Also available at most hardware stores. 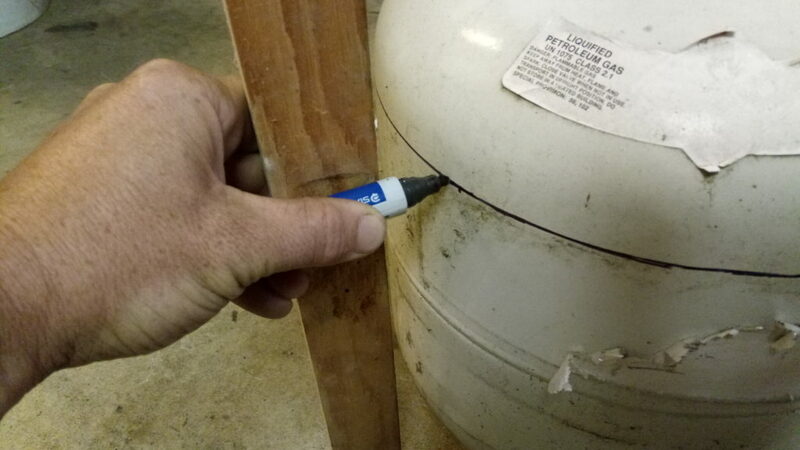 Before removing the propane tank valve, ensure the propane tank is empty by connecting it to a BBQ and trying to light the burner. If you can light it, then continue using it until you can’t. Then remove the propane tank valve. This can be a challenge. I was able to do it by using a large pipe wrench on the valve and a long bar through the handle of the tank for opposing leverage. There will probably be a bit of residual pressure in the tank that will be released as you loosen the valve so it is a good idea to do this in a well ventilated area. Once the valve is off, you need to make sure all propane has been expelled from the tank. The easiest way to accomplish this is to fill the tank with water till it overflows, and then drain it. I used a felt pen held at a fixed height to mark a line around the tank. I chose a height that looked right to me, knowing that the top of the tank will become the lid of the furnace and will need room to pack in a few inches of ceramic insulation. To start the cut use an angle grinder with abrasive cut-off disc. Once the cut is started started you may wish to switch to a reciprocating saw with a metal cutting blade. This will be much faster than the abrasive cut-off disc. It should only take a couple minutes to saw around the full circumference of the tank. The terminals of the range element need some extensions added to reach through the wall of the tank. 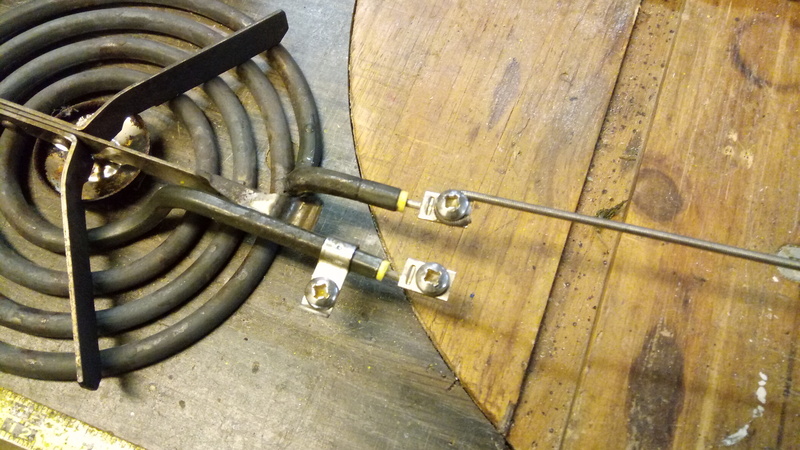 I used some steel rod I had handy (welding rod would suffice). Bend a loop in the end and screw it to one of the terminals. Cut the rod to a length with a hack saw such that it will stick out about 1″ from the side of the furnace when the element is centered. Repeat this process for the other terminal. Hold the element a few inches above the inside bottom of the propane tank and mark roughly the location of the holes where the terminals will need to pass through the side of the tank. Drill two holes about 1/2″ in diameter using a step drill. 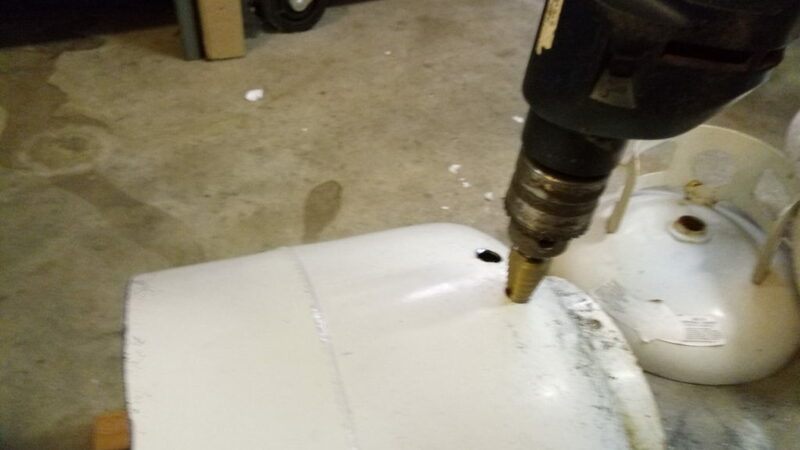 Fill the bottom of the propane tank with random chunks of ceramic insulation until you’ve filled in the concave portion of the tank. Using the top of the tank as a template, cut a circle of insulation to cover all the random chunks and provide a nice flat surface on which to rest the range element. You may need to experiment with different amounts of insulation to get the element terminals to line up with the holes. Wrap the terminal extensions individually with ceramic insulation to ensure they do not contact the sides of the holes which could cause a short circuit or present a risk of electric shock. Once you’re happy with the position of the element, add a couple layers of ceramic insulation around the inside walls of the tank. You should end up with something that looks like this. Note the above image shows only the first layer of insulation around the walls. Another layer will be added next to the first. Weld 4 screws inside the top of the propane tank in such a way that they would hold insulation in the lid. Let the screw heads protrude a bit past the lid so that when the lid is in place on the furnace the screw heads will help align the lid with the base. Using the lid as a template, cut a circle of ceramic insulation to fit. 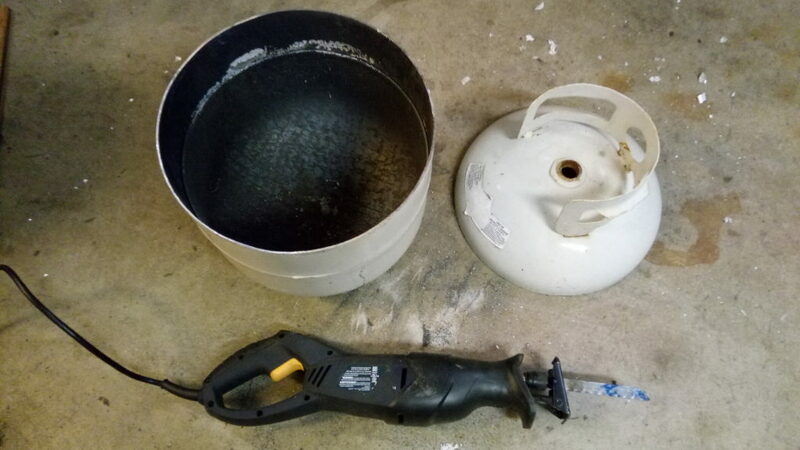 Fill the concave part of the lid with random chunks of ceramic insulation and the cover those with the circle of insulation, tucking the insulation under the screws. 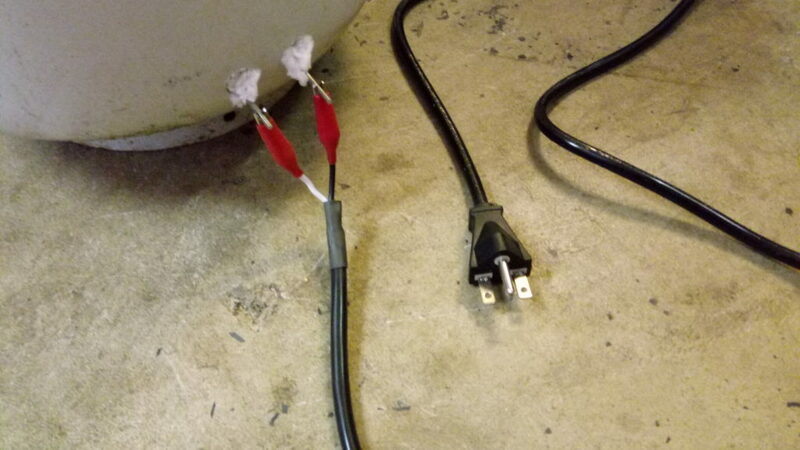 The first power cord I tested was a salvaged 120 VAC cord that I soldered a couple alligator clips to. If 120 VAC is the only power you have available it will suffice, but performance will be greatly improved at 240 VAC. Lucky for me I have a 240 VAC outlet in my garage for a large air compressor. However, I did not have a spare 240 V power cord which is why I did the first test run at 120 VAC. I’ve since ordered a 240 V power cord from Amazon and soldered a couple alligator clips to it. There are many ways to make a crucible. The simplest I know of is to use an empty soup can. The metal of a soup can is quite thin, however, and it will quickly oxidize at high temperatures, lasting only for a few pours. 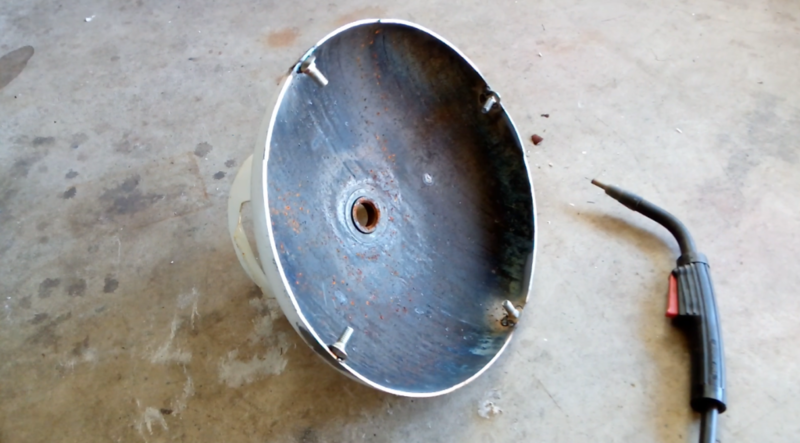 I made my crucible from a piece of 1/8″ wall steel pipe and a steel plate that I had in my scrap bin. After welding the plate to the end, fill the crucible with water to check for leaks. You do not want molten aluminum leaking out of your crucible while it’s in your furnace. Place the furnace base in a safe location away from anything flammable. Connect the alligator clips of the power cord to the terminals. 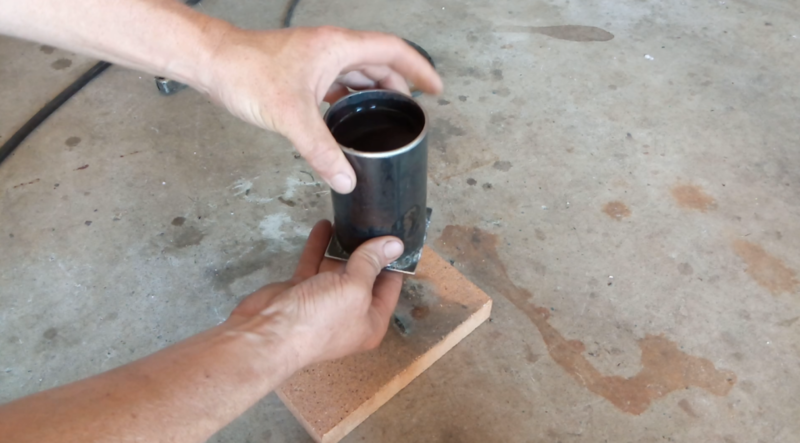 Fill your crucible with some pieces of aluminum and place it on the element. 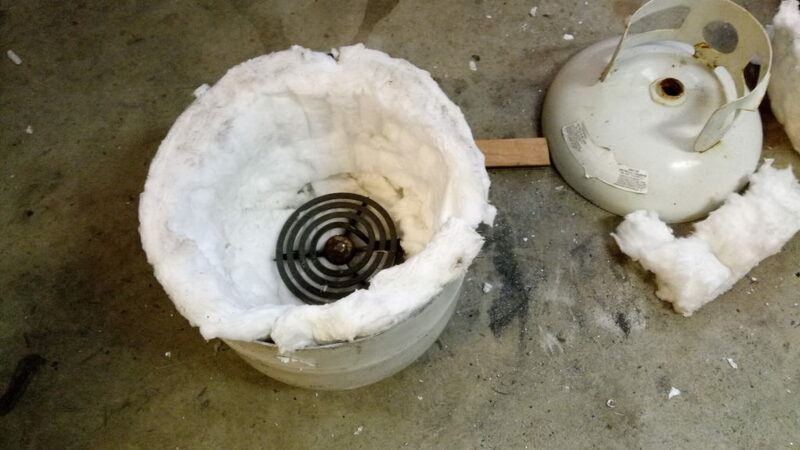 Place the thermocouple near the top of the crucible and put the lid on the furnace. Plug in the power cord and monitor power and temperature as the aluminum heats up and melts. Power meters for 240 VAC can be expensive, but if you can test the power at 120 VAC, there is no real need to do so at 240 VAC. Power is proportional to V squared, so at 240 VAC you will get 4 times the power you get at 120 VAC. I measured about 350 to 360 Watts at 120 VAC, so I know that at 240 VAC I’m getting about 1400 Watts. Power is also equal to voltage times current. Thus current is equal to power divided by voltage. At 120 VAC I am drawing about 3 Amps. At 240 VAC I am drawing about 6 Amps. Those figures are likely typical of most 6″ range elements. Aluminum melts at around 660 degrees C but needs to be about 700-750 degrees C to ensure a good pour without any unwanted solidifying. 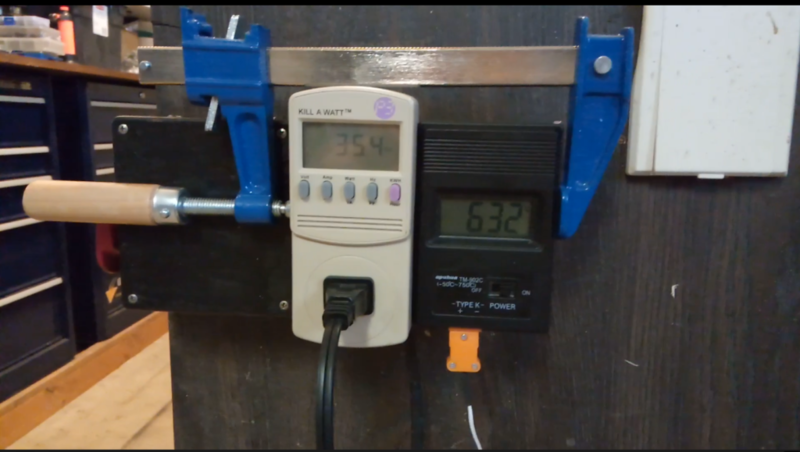 The temperature indicated by your digital thermometer will be the air temperature above the crucible which is likely hotter than the liquid aluminum since the air will heat up faster than the aluminum. If you are operating at 120 VAC, I would wait till the temperature reads around 730 to 750 degrees C before pouring. If you are operating at 240 VAC, the air inside the furnace will heat up much faster than the aluminum and the thermometer reading will be higher than the actual aluminum temperature. Therefore I recommend “soaking” for 5-10 minutes at temperature readings between 700 and 750 degrees C. Basically wait till the temperature reading hits 750 degrees C and then unplug the power cord. Wait till the temperature reading falls to 700 degrees C and plug the power cord back in. Repeat for 5 to 10 minutes before pouring. If you plan to make a lot of castings, it may make sense to add a temperature controller, but for limited hobby use, you can be the temperature controller, monitoring the thermocouple readings and plugging/unplugging the power cord to maintain the desired temperature. Heavy leather welding gloves and a pair of vise grips is all it takes to handle the crucible of molten aluminum. 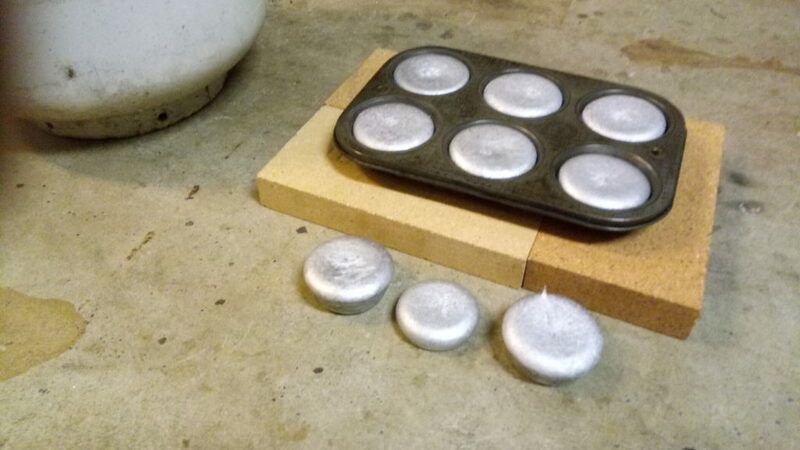 I was just testing the furnace so I poured some ingots for later use instead of casting anything useful. A muffin pan is the ingot mold of choice for the backyard foundryman. 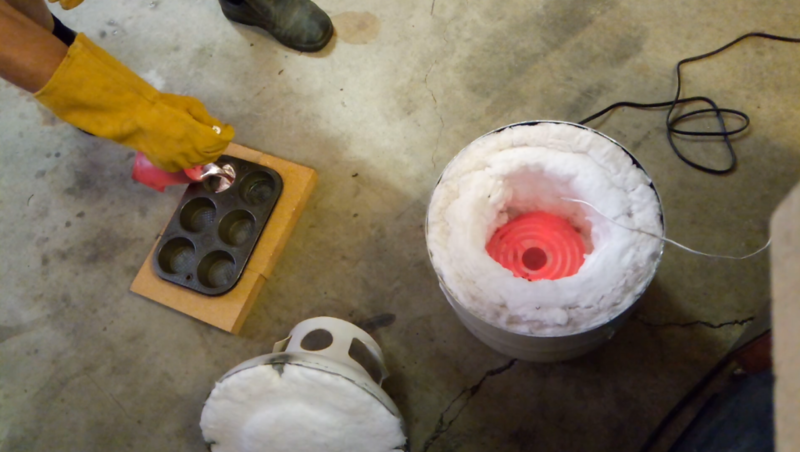 Whatever mold you use, make sure that the finished ingot will fit in your crucible. When connected to 120 VAC the furnace produces about 350 Watts and takes about 2 hours to melt some aluminum and bring the temperature up to adequate pouring temperature. When connected to 240 VAC the furnace produces about 1400 Watts (theoretically… I didn’t measure it) and takes only about 25 minutes to melt a similar volume of aluminum and bring the temperature up to adequate pouring temperature. I’m uncertain how long the range element will last, but it has survived several heatings at 240 VAC so far and shows no sign of decay. Considering how easy it was to build this furnace I’m very pleased with the results. If/when I do more projects related to aluminum casting I will update this page. If you would like to receive notifications when I post new projects, select the desired mailing list(s) below, and submit your email address. the ceramic insualtion link you provided was for a blanket 1″x24″x31″… will this be enough insulation to complete the project or will I need to purchase more? ?